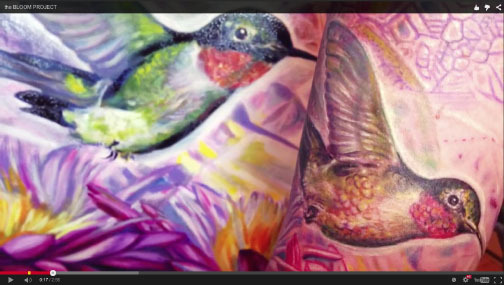 Michele Wortman's Bloom Project Featured in Tattoo Magazine, and in a New Video! Michele Wortman is known in tattooing for her innovative body sets. She has been designing a signature look for her mainly female clientele throughout her tattoo career. Starting with a desire to see a more unified and flowing female esthetic, 15 years ago, Michele embarked on an artistic journey to redefine more options for women wanting a lighter softer, balanced look within their tattoo collection. Many of these sets began with shoulder cap coverage, and gradually Michele's clients found themselves inking their way down to full sleeves and beyond. 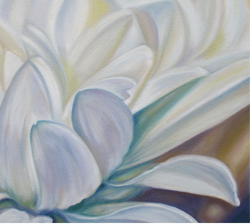 She began documenting this process, and the Bloom project was born. Michele identified with the word Bloom as many of her clients requested floral motifs from her, and she likened this process of unfolding through layers of ink, adding on over time and personal transformation to the similarities of a bloom opening to flower. Michele has inked several body sets and is currently working on an art book showcasing the lovely ladies she has been honored to tattoo and their process of collecting work through the years. The book will feature in-depth photos of her work as well as many of her clients who have come to be known as The Bloom Sisters. She is currently taking on new clients with this project in mind as well as trying to finish up work in progress in time for the 2020 publication. You'll be able to meet The Bloom Sisters in an ongoing series of articles in Tattoo Magazine, starting with a feature on Kristen Blinne in issue #304, which is on newsstands now. Michele has also produced a short video about the Bloom Project, offering a sneak preview of what you can expect when the book is released.